Monthly 北京人 dinner was held at Dainty Sichuan on Bourke Street last week, and it was so good that I not only can't believe I've never been there before, but I cannot wait to get back there again. Just getting inside was the most Chinese experience I've had since returning to Australia. A broken escalator, a queue at the door, westerners turning away with a grumble when told of the wait time, a lot of Chinese people sitting around waiting for their turn to get in. The smell of chilli and frying and tea and beer on the air. Oh so good, oh so delicious. I even spoke Mandarin on my way in. 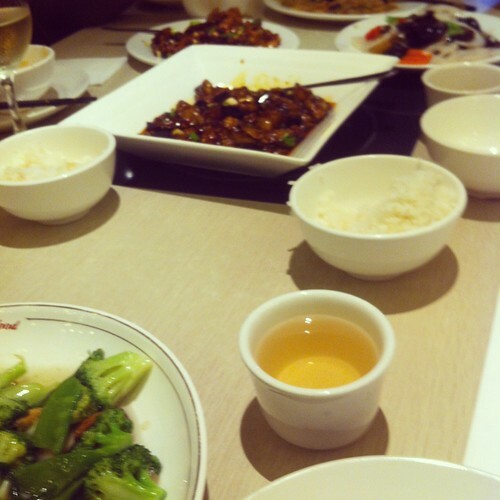 We ordered five dishes between the six of us, which actually turned out to be a perfect amount of food. One was meaty (kungpao chicken, ex-housemate V reports it was really good), the other four were straight from the 'vegetable' section of the menu: fish-fragrant eggplant, tudousi (yesssss), a mushroom + greens dish, and a dish predominately comprised of lotus root and black fungus. The mushrooms and greens dish had a whole lot of oyster mushrooms, and those oyster mushrooms were perfect. The tudousi was tudousi (ie, potato and delicious and oily), and the fish fragrant eggplant (free of fish, if you are unfamiliar with the dish) was so good. The dish with the lotus was a refreshing change from the spice and the oil. Service was a little hard to attract, and tea was charged $2pp which is the most I've ever paid for tea at a Chinese restaurant (though they did obey the action for 'omg more water in my teapot'). Bookings are definitely required as it was so busy. But I loved this meal. Food came out food and it was all delicious, and it only came to $17pp. I definitely look forward to returning. Next time I'd like to order the mapo doufu (modified to have no meat), the cabbage and chilli, and the cold black fungus with chilli, which is an old favourite. I hope to eat these things in the very near future, so hit me up if you need a friend to go with! I really love Sichuanese food. Om nom nom. Get there on most trams and trains. It's in the shopping centre next to JB-Hifi, follow the signs up to the karaoke on the top floor. There's an escalator up, but I'm not sure if there's a lift. Some words and things to help you navigate your way, especially if you don't speak (much) Mandarin. It helps to bring a buddy along who speaks it, though. wǒ shì sùshí zhě - 我是素食者 - this is "I am vegetarian", but it's not as helpful as you might hope. Often in Beijing, eating vegetarian just means you don't want meat as the main ingredient. So you want to emphasise that no meat thing. wǒ bù chī ròu - 我不吃肉 - I don't eat meat. This isn't going to cover you for everything, but it's a start. 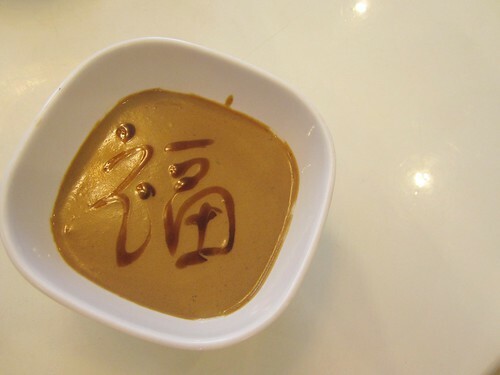 dòunǎi - 豆奶 - is soy milk, critical for ordering your coffee at Starbucks. Things you can order relatively free of meaty secrets: suàn lā tǔdòu sī - 算拉土豆丝 (sour and spicy shredded potato); suàn lā báicài - 算拉白菜 (sour and spicy cabbage); dì sān xiān - 地三鲜 (the three earth treasures, eggplant, potato and capsicum, I love this dish a lot). Eggs are considered a savoury ingredient - if you ask if something sweet has egg in it, you will be told no, but it will almost certainly contain an egg wash. Emergency breakfast: hot soy milk from the street venders in winter. It's vegan, it's delicious, it's warm. Good luck, vegans! Get out there and eat China. It's delicious, even for vegans. Bonus: Check out the cold menu. Lots of good vegan stuff on there. 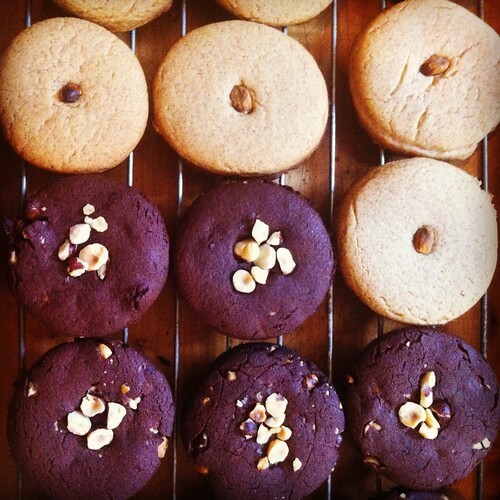 These are a variation on the ginger and five spice cookies that I bake all the time. If you've never tried my ginger and five spice cookies you should give them a go, or ask me to bake them because I love them and I will. Melt the coconut butter, combine with agave and sugar. Add in all the other ingredients (not the hazelnuts), and mix until it's even. Then mix in the hazelnuts. Roll to about a centimetre thick, cut into biscuits. Bake on lined/greased baking tray, and bake for 8 minutes at 180C. Allow to cool (someone I know burned their mouth on these today! ), then eat. I'm an Australian (Chinese + Anglo) member of Generation Y, by way of Malaysia. I lived in Perth for a while, and now call Melbourne home. No Award is where I write about media, pop culture, and social justice from a not USAmerican POV, along with my friend Liz. I am passionate about a hundred different things, and I use vegan about town to reconcile my ethnicity and my food obsession with being vegan. I blog about social justice issues at 天高皇企鹅远. I tumble at yiduiqie. I am a left-handed recurve archer, which is the best sort of archer to be. Get in contact by emailing yiduiqie [at] gmail etc or tweet me at @yiduiqie. Oh for the love of food!